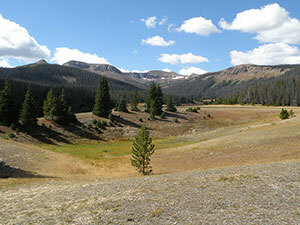 The United States Congress designated the Neota Wilderness (map) in 1980 and it now has a total of 9,927 acres. All of this wilderness is located in Colorado and is managed by the Forest Service. The Neota Wilderness is bordered by the Rawah Wilderness to the northwest, the Comanche Peak Wilderness to the east, and the Rocky Mountain National Park Wilderness to the south. Bordering Rocky Mountain National Park on the south and surrounded by other Wilderness areas, little Neota actually stands in a huge expanse of virtually roadless country. With elevations ranging between 10,000 and 11,896 feet, snow enjoys a long life here. Neota protects flattened ridges of granite atypical of the steep-sided Rockies. Just outside the southwestern boundary, Iron Mountain at 12,265 feet looks down on three main drainages within the area: Trap, Corral, and Neota Creeks. Along the summer-wet valleys of these streams, willows and sedges grow thick and occasionally hide a moose or two. You'll find spruce and fir on the lower slopes, home to deer and elk. You won't find a lot of maintained trails, but you will have ample opportunities to be alone. Planning to Visit the Neota Wilderness? How to follow the seven standard Leave No Trace principles differs in different parts of the country (desert vs. Rocky Mountains). Click on any of the principles listed below to learn more about how they apply in the Neota Wilderness.